What service member doesn’t want words of love encased in cold, expanded brass? 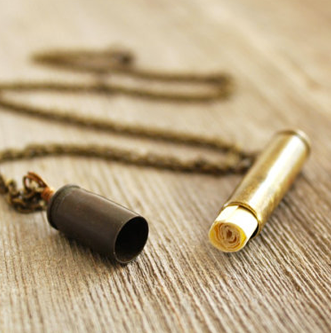 Each locket vial is one of a kind and hand-crafted from genuine re-purposed bullet casings. You get to choose the lanyard material (dark leather, light leather, or chain) and the length. Each comes with three pieces of parchment paper for you to write a note on and tuck away. Near or far, this is the perfect gift for a service member to keep close to their heart.